This training course will introduce the architectual concepts of Foreman, will cover installation, usage and administration. The configuration management solution used will be Puppet. This chapter will give you a basic understanding of the architecture of Foreman, its Smart proxies and Compute Resources. In this chapter you will get an idea on the different setups you can create, what is required for running foreman, how the installer works and will create an All-in-one setup including DNS and DHCP in preparation for unattended installations. This chapter provides basic knowledge on automated installation mechnism for Linux. You will learn how to configure them in the Foreman Web GUI. Afterwards several installation scenarios will be covered from bare metal installation using PXE over creating virtual machines using Compute Resources and metal as a service with Foreman's Discovery Plugin to creating a setup using installation media instead of PXE. Some basic explainations will give you enough knowledge to understand how Puppet works and to use it to configure newly provisioned systems to your needs. Some existing Puppet modules will be imported, parameterized and assigned to the systems directly or via a host group. Configuration runs will be reported back to Foreman so the administrator can see success and failure. Furthermore similar exercises are provided for Ansible. 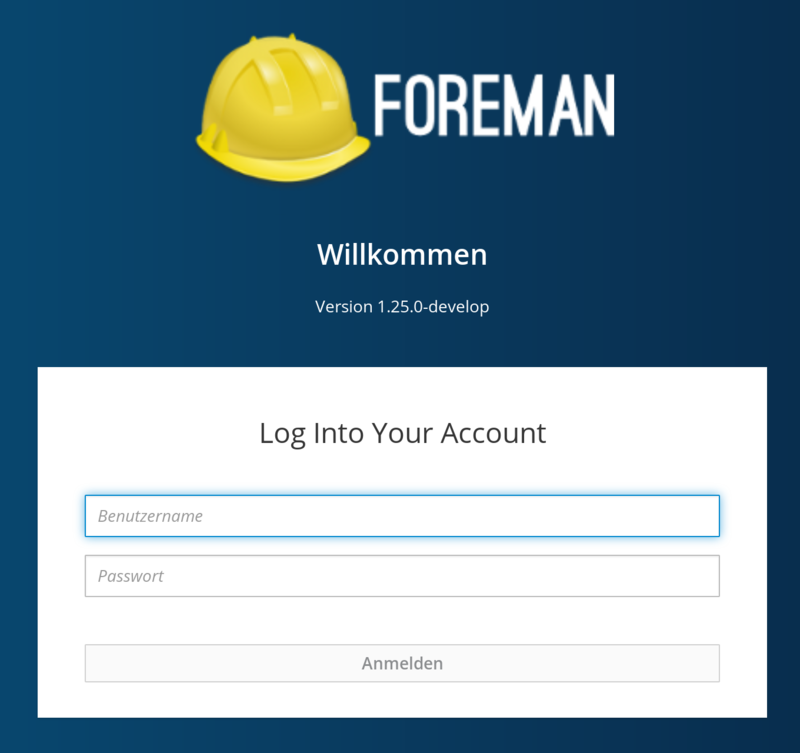 To give more users access to the Foreman Web GUI LDAP authentication will be added. Privileges will be added to the new users. Also the auditing capabilities of Foreman will be covered so you can see what your new users do. Some advanced topics like debugging, clean up, backup and restore will be covered in this chapter. Also the usage of the API and CLI will be shown. Furthermore additional plugins helpful in some environments will be introduced. And last but not least the trainer will show you Katello. This project adds content and subscription management to Foreman and is the upstream project for Red Hat Satellite 6. Ask questions! Dumb questions do not exist. Add your own notes! Having learnt something is reflected best with your own additions. Join the conversation! Many of these exercises require real world scenarios and your feedback and questions. Work together! Be part of the training team and find solutions together. Original authors are Paul Kelly and Ohad Levy, now working for Red Hat. More than 200 contributors, open bug tracker, IRC support. Foreman was originally writen by Paul Kelly and Ohad Levy and initially released on 10 September 2009. Now it is sponsored by Red Hat who use it as base for many of their Enterprise solutions like Red Hat Network Satellite and Red Hat OpenStack distribution. The project provides an open bug tracker for bug reporting and feature requests, its code on github, IRC support to help the community and consists of more than 200 contributors. Foreman provides in addition to the Web Interface an API and CLI. It supports as platform RHEL/CentOS and Debian/Ubuntu via packages and via installation from source also other Linux distribution. As database backend PostgreSQL, MySQL and SQLite are supported, while the default is PostgreSQL, SQLite is not recommended for productive usage. The smart proxy is an autonomous web-based component providing a restful API to connect to varios systems from higher ochestration tools such as Foreman. The Project provides packages for installation on RHEL/CentOS and Debian/Ubuntu. Installing from source allows to support other Linux distributions and also Windows which is required for some implementations of subsystems. There are different implementations of various subsystems included in the smart proxy by default and it easily allows to add additional subsystems and implementations as plugins. For configuration management the solutions differ to much to be covered by one subsystem. For joining a realm support for active directory is in development but for now only FreeIPA (an Open Source aquivalent to Active Directory focused on Linux) is supported. The Smart Proxy DHCP is used to add and remove host reservations to preconfigured subnets and allows to import them to foreman. On Linux typically a ISC compatible implementation is used to manage DHCP which allows to send commands via OMAPI. For Microsoft DHCP installation of the Smart Proxy on Windows Server system is required which needs netsh command installed and the user running the service needs administrative privileges, but the server does not need to be the DHCP server. For testing enviroments also an implementation for Libvirt using libvirt API to manage the dnsmasq underneath is available, a productive use is not recommended. Additional providers like infoblox or remote connection to ISC DHCP are available as plugins. The Smart Proxy DNS is used to add and remove dns records of type A and PTR, Foreman 1.12 introduced support for IPv6, but there is no support for additional records. For doing such updates it requires the zone to be a dynamic zone. Commonly used on Linux is Bind which takes updates via nsupdate with preshared keys or if used in FreeIPA with Kerberos principal. The same mechanism could be used for sending updates to Microsofts DNS. Another possibilty is to install the Smart Proxy on a Windows server and give it the privileges to run dnscmd. Other implementations like PowerDNS and Route53 are also supported. Libvirt is again only supported as a testing environment. Additional providers like infoblox or powerdns are available as plugins. The Smart Proxy TFTP provides boot-images for PXE boot, these files are simply downloaded using wget the first time needed. PXE configuration is created during provisioning based on MAC address. For this subsystem in the most cases no manual configuration is required because it is completly included in the basic setup. The Smart Proxy Puppet connects to the API of Puppet to query puppet environments and classes for import. It optionally triggers immediate Puppet runs using the deprecated puppet kick command, mcollective, executing puppet agent command via ssh on the remote system, salt or any custom script. Also it automatically allows a Puppet master known to Foreman as Smart Proxy to upload facts and reports. In addition the Puppet master can access Foreman as an External Node Classifier to build its catalog. The Smart Proxy Puppet CA is independent from the one for Puppet. It requires access to Puppet's ssl directory, the autosign configuration and puppet cert command via sudo. The Web GUI utilizes the Smart Proxy for certificate management and creates autosign entry for hosts during provisioning for accessing puppet without manual intervention. Compute Resource refers to a virtualization or cloud service which is integrate into Foreman as a plugin. Those plugins are based on the ruby cloud service library named fog and allows to create and manage virtual hosts. Depending on the provider machines are installed from an image or unattended in the same fashion like a bare metal host. It allows to access the console and do power management operations like shutting down or resetting the system. Some providers also allow to change the virtual hardware afterwards. The table shows the providers directly supported by the Foreman Project and its capabilities, additional providers like OpenNebula are community contributed. Compute Profiles allow to predefine the virtual hardware as a template to select for provisioning. On the mentioned operating systems packages are provided by the project, a installation from source is not recommended. On all platforms all updates should be applied before installation. 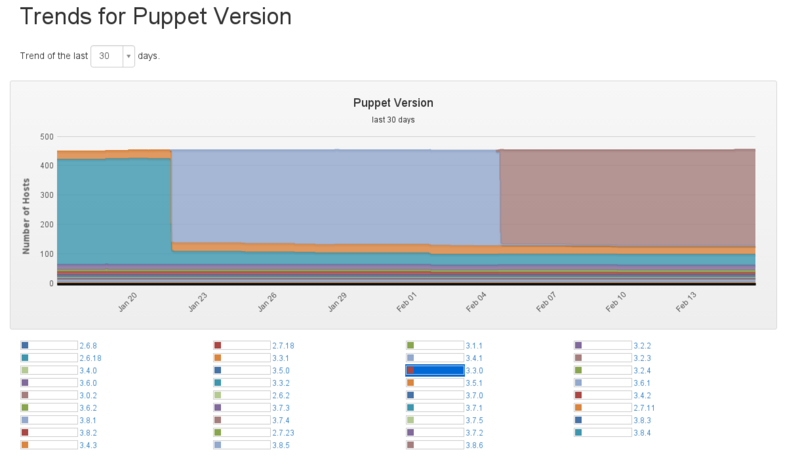 Using the Puppetlabs Repository providing an up-to-date version of Puppet is preferred which of the supported versions touse is based on user requirements. Puppet 4.x and 5.x is supported with current versions for All-in-one and Filesystem-Hierarchy-Standard packaging standard. Puppet 3.x support was dropped with Foreman 1.17. Puppet Enterprise is not supported, but can work with manual tweaking of the setup. Both versions of the central server in a Puppet environment are supported. If the All-in-on package of Puppet 4 or 5 is found it will use the Puppet Server, in all other cases it will setup Puppet Master using Apache and Passenger. Support for structured facts provided by Facter 2.x was added with Foreman 1.12. Depending on your installation the ports above are required to be accessable on the Foreman server, by Foreman and the managed systems. The Foreman installer is based on a separate project named kafo (Katello/Foreman Installer) which could also be used by other projects. It utilizes existing Puppet modules to install and configure all required components. Module parameters are provided as commandline arguments to the installer, as an answers file formatted in yaml (can be autosaved) or by running the installer in interactive mode. The installer supports also predefined scenarios which is only used by Katello for now. The Foreman installer allows to setup different scenarios depending on its parameters or answers in interactive mode. All the scenarios above are explained in the course material, commands required can be found in the Foreman manual on the project homepage. For the training we will stick to the default all-in-one setup and add additional Smart proxies. Preferred scenario for growing the Infrastructure and making Puppet Master high available. But all Puppet Master depend on Foreman so place it on a high available machine. Requires certificate for communication and OAuth provided in the settings of Foreman. Integration of existing PuppetDB, no installation! If the Puppet agent on the Foreman server has already run the domain will already be created but not associated. With Foreman 1.21 multi-tenancy is active by default, but not all objects get it assigned by default. Subnets are not automatically created like domains. The Smart Proxy should be moved into organization and location before creating the subnet. Server provisioning is a set of actions to prepare a server with appropriate systems, data and software, and make it ready for network operation. Wikipedia defines server provisioning as a set of actions to prepare a server with appropriate systems, data and software, and make it ready for network operation and your task will be to automated it. For an automated installation it is required that the installer of the operating system allows to answer the questions normally asked to the users by providing an answer file. The different Linux installers can handle answer files provided via network protocols like http and ftp, network file systems or placed on the installation media. In this way basic configuration like timezone, language or network settings can be handled, furthermore partition layout can be created, software is installed and depending on the solution also registration to management tools is directly integrated. If the installer could not solve requirements directly, scripts could be provided to be executed during and after installation. The mechanism differs for the distributions. Other operating systems have similar mechanisms but not all the capabilities. Microsoft Windows for example requires answer file to be placed on the installation media or a "physical" disk mounted during installation like floppy or usb. Regardless of the capabilities with configuration management in place do a simple installation and let the configuration management solution do its work. Kickstart is the answer file to the installer used by Red Hat Enterprise Linux, CentOS, Scientific Linux, other derivates and Fedora. It is basicly a simple text file providing commands for basic configuration and partitioning in its main section and a list of packages and package groups to install in addition to the core system in a package section. Skripts can be added in separate sections to run as pre-installation task or post-installation on the installer or using chroot on the installed system. Lastest versions allow to extend the installer with addons which can also provide its own kickstart section for automation. One example is the OSCAP Anaconda Addon which allows to validate against a security profile already during installation. The URL to the kickstart file can be provided during installation or for automation added as a kernel parameter to the boot media. Necessary answers missing will be queried. Preseed is the answer file for the Debian Installer used by Debian and Ubuntu. It is basicly a simple text file providing answers to the installation questions. It uses for all types of configuration the same syntax. Scripts can be downloaded to the system and be executed after the installation. The URL to the preseed file can be added to the boot menu entry or as a kernel parameter to the boot media for automation, an additional parameter tells the installer to run unattended or use the answers only as default. AutoYaST2 is the answer file for SuSE Linux Enterprise Server, Desktop and openSuSE using YaST2 as installer. It is a structured XML file meant to be created by YaST and not by hand which provides answers to the installer quests. Different data structures are used for all kinds of configuration. It can run scripts before installation starts, after partitioning, after package installation using chroot, post installation on first boot before and after starting services. In addition it can configure selected software and devices like printing service or soundcards. Other services can be configured with an file based configuration management. The URL to the autoyast file has to be added as a kernel parameter to the boot media. Furthermore it allows to create a control server providing rules to automatically select autoyast files. In Foreman the provisioning is centred on the operating system which has to be associated to the hardware architectures like i386 or x86_64, the installation media being the URL where to find the boot media and software packages, partition tables and provisioning templates. The templates are using ERB (embedded ruby) which allows to use parameters in the files, basic scripting like conditionals and inclusion of snippets. Snippets can be everything from scripts to configuration files you want to maintain independently because it is the same configuration for inclusion in different other files or it will bloat up one file to render it unmaintainable. Depending on different provisioning mechanisms and methods other kinds of templates are required. Templates can be associated to operating systems, host groups, environments or combinations of host group and environment. It will then select the templates to use on best match. Partition tables are handled separately to allow the usage of the same host template with different disk layouts. Associate the operating system with the Partition table "Kickstart default", Installation media "CentOS mirror", select the Templates and set Parameter "enable-puppetlabs-puppet5-repo" to "true"
Create the Operating system "Debian" with Major version "9", Description "Debian stretch", Family "Debian", Release name "stretch"
Associate the operating system with the Templates and set Architecture "x86_64", Partition table "Preseed custom LVM" and "Preseed default", Installation media "Debian mirror" and set parameter "enable-puppetlabs-puppet5-repo" to "true"
Tell the students to skip Debian if only providing a local CentOS-Mirror. The Foreman Plugin Setup is created to help with the initial setup (the steps we did manually). It asks for domain and subnet information as input and will output Foreman-Installer commands. In addition it will ensure configuration of the Foreman host, association of templates and operating systems and existence of installation media. Lab 4.3: Create a virtual machine "pxe"
Name your VM "pxe" and select the network "foreman"
If the environment is not avialable, assign it to "Default Organization" and "Default Location". Open Foreman's host dialog using "Host > Create Host"
On the Operating system tab select the Architecture, Operating System, Media, Partition table and set a Root password. On the Interface tab click edit to configure the interface with the MAC address, identifier "eth0", select Domain and Subnet and keep the suggested IP address. In the Interface tab it is possible to add multiple interfaces and also virtual interfaces like VLAN tagged interfaces or aliases. Only one can be assigned as the primary interface mapped to the DNS record and only one as provisioning interface for PXE configuration or connecting for executing scripts during installation. This can be the same interface but does not have to be in cases you have a dedicated installation network. Instead of setting the root password for every host created, a default can be set by providing a password hash on "Administer > Settings" in the Provisioning tab as Root password. This is an MD5 hash for being supported by every Linux distribution. Hostgroups are used to group hosts, the groups can be organized in a hierarchical way by nesting them. The Hostgroups allows to add defaults for all options required by Foreman for provisioning and depending on your environment also for configuration management and compute resources. Additional parameters can be set. Furthermore to providing defaults configured at the hostgroup "Provisioning templates" can be associated to change from the operating system default. Copy the public key to the root account of the host "host.localdomain"
The Compute resource does not only provide the possibility to provision virtual machines, it also allows access to power management of unmanaged systems and to deleted them from the virtualization platform. Also associating an unmanaged system to an already existing one is possible. In the Virtual Machine tab change the Storage type to "QCOW2"
In the Operating system tab select the Architecture, Operating System, Media, Partition table and set a Root password. In the Interface tab click edit to configure the interface with identifier "eth0", select Domain and Subnet and keep the suggested IP address, for the Libvirt options choose the virtual network "foreman"
Compute resource options depend on the used Compute resource so other options will be available for VMware than for libvirt. Defaults for the Compute resource options can be set using a Compute profile. Storage type "QCOW2" enables you to use snapshots unlike "RAW". Compute profiles are used to provide defaults for the virtual machine creation. Per default three profiles are available and only have to be configured, but you can create as many as needed. The same profile can differ based on the Compute resource used to provide defaults matching the virtualization platform. If one is configured for a Compute resource option to choose from it is available on new host dialog after choosing the Compute resource to deploy on. On Compute resource using "New image"
Images are available as install source to all Compute resources, for some as the only source. To be available to Foreman it has also to be configured using the "New image" dialog after selecting a Compute resource. The image has to be created with an user which has shell access to run finish scripts and depending on the Compute resource also user_data scripts can run during virtual machine creation to change settings. If a image is configured it is possible to choose it from the "Create host" dialog on the "Operating system" tab. In some cases it can speed up the installation process, but of course an unattended installation will give you a cleaner and more up to date system. If using a configuration management a very basic image should be prefered, but if required a image can be very featureful like having some proprietary software installed which is quite complicated to install with configuration management. The protocols available are VNC and SPICE, encryption and authentication depends on your setup. If you want to try it in the training environment you have to enable the connection by executing the following command on the laptop. Furthermore Firefox will block the websocket connection unless you change setting network.websocket.allowInsecureFromHTTPS to true in about:config. Lab 4.8: Create a virtual machine "discovery"
Name your virtual machine "discovery" and select the network "foreman"
Create the virtual machine and when the PXE menu appears select "Foreman Discovery Image"
On the Discovered host view select the action "Provision" and then "Customize Host"
On the Interface tab click edit to configure the interface add the Domain "localdomain"
Located in "Configure > Discovery rules"
Requires "Discovered" setting "Auto provisioning" changed to "true"
Discovery rules allow an automatic rule based installation. 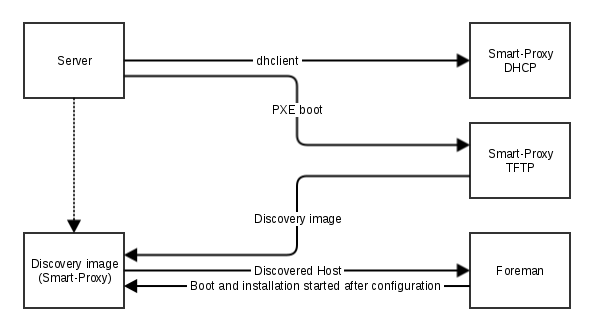 Depending on facts provided by the discovery image a rule is selected and the system is installed based on the configuration of the selected hostgroup. Naming is done based on a template using ERB which allows to use facts or random numbers, by default the macaddress is used. Setting a limit and a priority allows some ordering like deploy first two backend systems of this size and then two frontend systems. Usage of the rule based installation is not enabled by default but simple switched on by changing the "Discovered" setting "Auto provisioning" to "true". The discovery image is provided by the project also with corresponding tools and documentation on extending and remastering it. It also allows to add custom facts in its interface, as boot parameter or as an extension which enables a workflow like booting the image and adding desired system type as fact. Furthermore it could be used in enviroments without PXE and DHCP by providing all settings including an ip address and boot directly into a new kernel with kexec. This is only available for Red Hat derivates at the moment. For the installation in an environment you do not have total control over the network infrastructure the Foreman Plugin Bootdisk provides 4 kinds of boot images based on iPXE. The host image contains a static network configuration, loads the installer from the media configured in Foreman and the Provisioning configuration from Foreman itself. So it requires no DHCP and TFTP in the network. The full host image contains the operating system specific installer so it requires no downloading of it, but is configured to boot from DHCP instead of having a static network configuration. To get its Provisioning configuration from Foreman it identifies itself with a token only valid for one deployment. The generic image boots from a dynamic IP address of the DHCP pool and is identified by the MAC address for Foreman providing the correct installer via TFTP and Provisioning configuration to load. The subnet image is basicly the same as the generic image but uses another TFTP server specified for the subnet. Depending on the Compute resource used the plugin adds disk based provisioning. Lab 4.11: Reinstall the virtual machine "pxe"
Configuration management is a systems engineering process for establishing and maintaining consistency of a product performance, functional, and physical attributes with its requirements, design and operational information throughout its life. Wikipedia defines configuration management as a systems engineering process for establishing and maintaining consistency of a product's performance, functional, and physical attributes with its requirements, design and operational information throughout its life. So configuration management software is used to describe a desired state, configure a system to be in this state and recognize drifts from this state to revert them. Foreman integrates different tools to solve this task. Puppet is deeply integrated because Foreman started as a WebGUI for it, but it is planned to move on to a state being a plugin equal to all the other solutions. The features of the plugins differ depending on the capabilities based ont the tools they depend on. For example some can only report system information and state while others can assign a configuration using the web interface. Some tools also have a focus more on rapid deployment than on managing the system state. We will use puppet in this training because it provides the complete feature set and its descriptive language is also quite accessible/readable without knowing puppet in-depth. Manifests stored on a central server "Puppet Master"
Next slide provides a diagram of the workflow. Puppet is written in ruby and provided as a true Open Source version and as an Enterprise version with additional features and packages with a defined software stack for easier support. Independently of the version it runs on Linux, Unix and Windows it can also configure some network devices. For configuration it uses its own declarative language called Puppet DSL (Domain Specific Language) you can see above (example). The desired state is described in so called manifests which are stored on one or multiple central servers. To connect the different configuration items with the node to be configured these central servers can use an ENC (External Node Classifier). The agent runs on the nodes and collects system information using a tool named facter before contacting the central server. The master compiles then a catalog based on the facts provided by the agent and the manifests. This catalog is then realized by the agent using an abstraction layer and also sends a report to the master. The master uses different handlers to send the report to other tools. A diagram showing this workflow is provided on the next page. Foreman integrates Puppet in several ways and also integrates itself into Puppet. Communication from the WebGUI to Puppet is handled using the Smart proxy for Puppet. It allows to import Puppet modules known to Puppet and to trigger Puppet agent runs using several protocols. The Smart Proxy Puppet CA integrates certificate handling into provisioning so auto signing of the agents certificate requests during build is allowed and also allows to manage the complete CA in the WebGUI. On the Puppet master a script is deployed which integrates Foreman as an ENC so classes selected in the WebGUI are deployed on the system. This mechanism is also used to upload the facts provided by the agent during Puppet agent run and creating a host entry if facts are provided for an not already existing system. 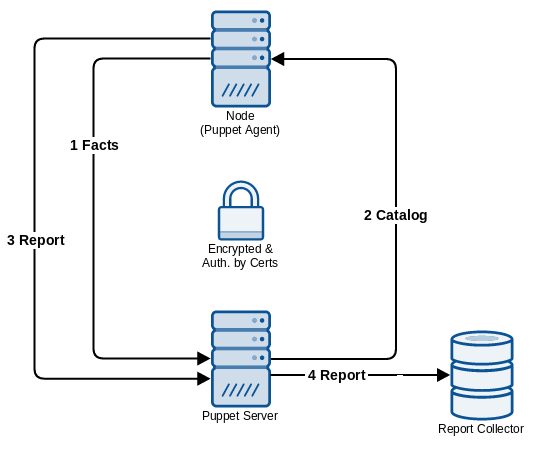 Also Puppet is integrated as a reporting target to enable the web interface to show reports. Place Puppet modules in Puppet environment "production"
Foreman does differentiate between three kinds of parameters. Parameters are global parameters in a very simple fashion. Their values can only be strings and override is simply done by creating a parameter with the same name in a more specific scope. To Puppet they are presented as a global parameter via the ENC, in Foreman they can also be used in the Provisioning Templates. Smart class parameters become available from imported Puppet classes and can have different types like boolean, hash or yaml. For this types an input validator can be created to verify user input. An override behavior and order can be defined to enable merging values depending on facts. Smart variable provides the same options as Smart class parameters but are manually assigned to a Puppet Class and provided to Puppet as global parameters and not class parameters. All types have to be created on the global scope to be available in more specific scopes and all allow to hide them from unprivileged users. Config Groups allow to group classes and assign them in the same way you would use single classes. This follows the same ideas like the very popular Roles-Profiles-Pattern used in Puppet to simplify assignment via another layer of abstraction. The Smart proxy Puppet allows to trigger the Puppet run we manually triggered in the last exercise from the WebGUI. For this we enable it by setting the option "Puppetrun" to true and configure the Smart Proxy to use one of the mentioned providers, but all of them will also require some configuration on the agent side. The Foreman plugin Remote Execution is more flexible and also handles the agent configuration but only provides SSH for now. We will have a deeper look into this instead of configuring the "Puppetrun" feature. It is also possible to manage Foreman and/or its Smart Proxies using Puppet. The modules to do so are provided by the Foreman Project itself and are already used in the Foreman Installer. The modules are written to be compatible with all supported platforms. For compatibility of the modules with the Foreman or Smart Proxy version observe the notes in the README. File. The modules provided can configure Foreman, the Smart Proxy and Puppet in the way it is required by Foreman and the services required to run Foreman or managed by the Smart Proxy. The Puppet module "foreman" provided by the Foreman project includes a function to query the Foreman API in a puppet class. This is an alternative for exported resources or a PuppetDB query. It takes a hash with the login data and the query and returns a result hash including an array of hashes describing the hosts. The hash is best used with a defined resource and create_resource function or within a template. Next release of the function will also allow to provide a filter for reducing the data for easier handling. Ansible is written in python and its control machine runs on Linux while it is possible to manage Linux, Unix and Windows. For configuration it uses yaml format for simple playbooks and some additional structure for roles. An example for one task is shown above. Those files are stored on one or more control machines which also need an inventory as a static file or script for dynamic inventory. There is no agent required as it utilizes SSH (or winrm for Windows), so the control machine connects to one or more systems to collect system information and run tasks on them. Afterwards callback plugins are used to report back to other tools. Foreman can integrate Ansible in several ways and can also integrate itself into Ansible. Communication from the WebGUI to Ansible is handled using the Smart proxy for Ansible. It allows to import Ansible roles known to Ansible and to play Ansible roles. On the Ansible control machine a callback plugin can be activated to upload facts and reports to Foreman. Forthermore a script could be deployed to use Foreman as dynamic inventory. Graphical integration uses Remote-Execution plugin which will be covered later in more depth. 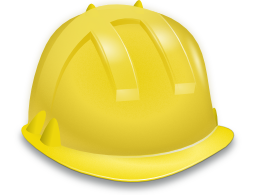 Foreman supports LDAP authentication natively and provides a webbased configuration for it. Supported are LDAP and LDAPS as protocol, (at the moment) for now no StartTLS. If using certificate based encyrption trust to the certificate is mandatory. It supports the POSIX, Active Directory and FreeIPA schema for storing users and groups, but attribute mapping can be configured manually. For the autocreation of users the attributes "Login Name", "First Name", "Surname" and "Email" are required, optionally a avatar can be stored as base64 encoded string in a "Photo" attribute. Foreman can also be configure to use an external authentication provided by the webserver. In most cases this will be Kerberos to achieve a true Single Sign-On. If you use FreeIPA as your authentication provider the Foreman Installer can create the required configuration by passing the corresponding parameters to it. If you use another provider like Active Directory or a manually managed Kerberos it is possible to create the required Kerberos and PAM authentication on your own and tell Foreman to accept external users. Another way to configure Foreman to use external authentication providers is by using the Apache module "intercept_form_submit" to pass the login form input to PAM for validation. It is also possible to enable autocreation of users in Foreman for external authentication. Also note that Foreman differentiates between WebGUI and API login for external authentication so it is possible to allow external users to only connect to one or both. Assign the role "Viewer" to the user "viewer"
Assign the new role "Selfservice" to the user "selfservice"
Foreman logs almost all changes from the WebGUI and API including the user, a timestamp, the change and the parent object like the host or a parameter got changed. For templates an additional diff of the changes is provided. All this auditing data are browse and searchable in the WebGUI via "Monitor > Audits". To get detailed auditing data or specific change history simply select an entry. Foreman provides a new notification feature to notify about your own actions since 1.15 which is already used by Foreman and many plugins. This allows to keep track of actions run independently. Foreman can send email notifications to the user. This requires email settings configured in Foreman via the Foreman Installer or manual editing of the configuration file "/etc/foreman/email.yaml". 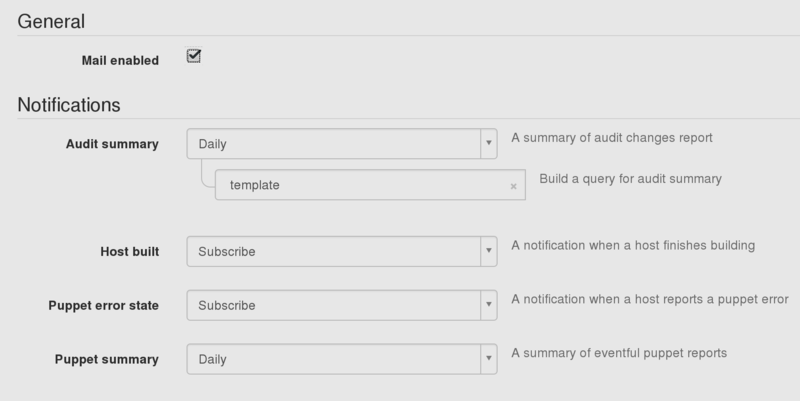 With this configuration in place a user can decide to opt-in for several kinds of notification. It can send a daily, weekly or monthly summary of audit events which allows to add a search to specify a subset of events. It also can notify on every successful host build and for Puppet runs on every failed run or as a frequent summary. 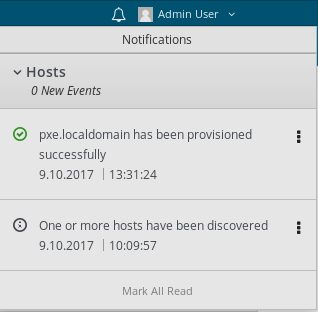 Foreman provides a new notification feature allowing users to manage their own SSH keys since 1.15 which is made available as parameter on hosts owned by the user or its groups. An example for usage during provisioning is provided in the snippet "create_users". Plugins can extend Foreman and the Smart proxy in many different ways and depending on the needs it can be very simple or highly complex. Some of the options will be shown in the next slides where some of the plugins are introduced. For all options have a look at the "how to create a plugin" at http://projects.theforeman.org/projects/foreman/wiki/How_to_Create_a_Plugin or "how to create a Smart Proxy plugin" at https://projects.theforeman.org/projects/foreman/wiki/How_to_Create_a_Smart-Proxy_Plugin. If a host does not already exist, it will be created when the first puppet run triggers the upload of the facts. Normally the host is added without any additional configuration in Foreman, the plugin "Default Hostgroup" simply adds the possibility to set a default hostgroup to assign to these newly created hosts. This allows to add a classification via the hostgroup already on the first run and without manual intervention. To use it simply install the package and create a file "/etc/foreman/plugins/default_hostgroup.yaml" containing a hash which maps facts to hostgroups to assign. The plugin is very useful if you plan to embed Foreman in an already puppetized environment as Puppet ENC. By installing the plugin you get a synchronisation job for templates which per default import the community templates from https://github.com/theforeman/community-templates matching your Foreman version and adding support for more operating systems. This job can also be used to import your own git repository if you want to manage the templates on an external version control system. In addition the imported templates will also be associated to the existing operating systems. The Foreman Plugin DHCP Browser adds a DHCP management interface to the Foreman WebGUI next to the subnets which allows to browse DHCP reservations and it is also quite useful for managing reservations for hosts not managed by the Foreman. The Foreman Plugin Hooks allows to add scripts on events handled by the Foreman. Typically it is used to integrate other tools during the orchestration process of deploying new hosts instead of writing a new plugin. For this the status of a script executed is also shown in the WebGUI and handling for failures and rollback is also provided. Another use case is to work around the limitations and problems of tools like changing parameters of VMs which is only available after the creation but are required before starting them. When PuppetDB is used with Foreman there is normally no interaction between both, they are completely two different independent report targets. With this plugin a host is also disabled in PuppetDB when it is deleted in Foreman. In addition the PuppetDB dashboard is also integrated in the Foreman WebGUI to display the performance of the backend. The Foreman Plugin Column View is a very simple example of enhancement an existing view in Foreman but could be verify useful in combination with some custom facts like showing the responsible team or project. It is also capable of adding additional links to other webinterfaces providing additional information. Other resources like the "National Institute of Standards and Technology"
OpenSCAP is the Open Source implementation of Security Content Automation Protocol which combines different pre-existing security standards like CVE, CCE, CPE, CVSS, XCCDF, OVAL, OCIL, AI, ARF, CCSS and TMSAD. All these informations are combined in datastream files which can contain different profiles a system can be validated against. To get a compliant system a guide can be created or a compliance report including some remediation scripts. The required files can be created by hand but are in XML so best practice is to use a tool like the Workbench to tailor the existing files to the like of the one provided by the OpenSCAP project or the "National Institute of Standards and Technology" (NIST). Not used by Foreman for now is the Anaconda Plugin OpenSCAP which can also add security compliance as part of the installation process. With Foreman 1.11 the Plugin got a rewrite to remove the dependency on "scaptimony"! With Foreman 1.15 the Plugin was enhanced to support tailoring files. The Cockpit project provides a WebGUI to manage Linux servers. It is available as native package or priviledged docker container for atomic on RHEL, CentOS, Fedora, Arch Linux and Ubuntu. The Foreman plugin searches for an existing installation and integrates it into the Foreman WebGUI. The Foreman Plugin Remote Execution adds WebGUI and workflow for executing jobs on remote systems. It utilizes different providers, which are SSH and Ansible for now. The SSH provider runs per default command as root, but can also be configure to run as unpriviledged user and run sudo to accquire elevated privileges. It is usefully to trigger configuration management runs immediately to get an adhoc deployment, execute one-time or irregular commands and also to orchestrate operations like updates on your servers. It also allows to schedule jobs or reoccurring execution. With the OpenSCAP plugin installed in addition an option to run scans on demand is added. It is also possible to write templates for jobs in a similar manner like Provisioning Templates. In this templates you can use a special function "input" to get the value of input fields associated to it. These fields can be a free-form or list of values for a user to add, facts, variables or Puppet parameters. Furthermore you can reference another template, which you can also render in your newly created one with the "render_template" function. The default templates provided are "Puppet Run Once" to trigger a puppet run, "Package Action" for handling package management and "Service Action" for managing service which both include operating system specific handling and "Run Command" to run a simple commandline. The Foreman Plugin Expire Hosts allows to add an expiration date on hosts and to configure notifications for owners and admins in advance, automatically shutdown when the hosts is expired and delete it also automatically afterwards. This is quite useful on virtual machines used for development and testing, for hardware shutdown and deletion can not be automated but it will at least notify. The Monitoring integration is done via a Foreman plugin for the graphical part and a Smart proxy plugin for the communication. So it shows a global and detailed monitoring status for hosts, manages monitoring objects during provisioning and deprovisioning and allows to set downtimes. For now it only supports Icinga 2 as monitoring solution and if requiring a more comfortable administration Icinga 2 and in addition its graphical frontend Icinga Web 2 Director. In the Foreman WebGUI almost all views are simple unfiltered lists, some views like the "Reports" view are filtered by default using a search and most provide additional searches to quickly filter for typically views like 'all hosts out of sync'. But the WebGUI is not limited to these searches you can always create your own and bookmark it for later. Setting a bookmark to public allows to share it with other users. The search field can be used for a free text search but gets more powerful if using the autosuggestions. It provides different comparison operators depending on the type of the field compared including SQL like wildcard matching. Foreman can provide graphs about changes in your environment. Those are configured and displayed in the WebGUI in "Monitor > Trends" and a cronjob is performs the data collection. By default this cronjob runs every 30 minutes matching Puppet's default run interval because most trends will be based on the facts collected by the configuration management solution, another source are Foreman's internal parameters like the operatingsystem of the host. The configuration management solution sends reports to Foreman which are then stored in the database afterwards. Depending on the solution, configuration and interval the required storage space can differ. Foreman provides a cleanup job for this. Best Practice would be an execution as a cronjob. The command takes parameters for the maximum age to keep the status of the reports. Depending on your needs configure a daily cronjob like this to delete all reports 'without event', 'after one day' or those with events 'after 7 days'. In a regular interval, at least before an upgrade! Backup should be done in a regular interval, but at least performed before any upgrade, and it should cover all components. Foreman backup can be done by archiving the configuration directory "/etc/foreman" and for the database a dump can be generated with the following command "foreman-rake db:dump" provided by the Foreman. The Puppet backup should include the certificates which are located in "/var/lib/puppet/ssl" on the Puppet CA server and the Puppet Code underneath "/etc/puppet/environments". Other configuration management solutions will be handled in a similar way. To backup the Smart proxy, archive the folder "/etc/foreman-proxy" and do not forget about the managed service. For this follow the instructions for the service. With the "Orchestration rebuilder" feature, the Foreman can also rebuild all configuration issued via the Smart proxy from the "All Hosts" menu as an action. Always stop the service before doing any restore! Before starting a restore always stop the service! Restore the configuration directory of the Foreman carefully and inspect it before overwritting the current one. The database dump can be restored with the command "foreman-rake db:import_dump file=/usr/share/foreman/db/foreman.TIMESTAMP.sql". Drop an existing database in advance to have a clean restore. For Puppet restore simply copy back the files, the same goes for the Smart proxy. The managed services should be restored according to their instructions. Always follow the instructions in the Foreman manual! Always follow the instructions in the Foreman manual providing release and operating system specific steps to do. In general you should start by creating an up to date backup of the old configuration. Afterwards you have to change the package repository to the newest release because Foreman is always providing a separate repository for any major release. Then cleanup the package metadata and update the packages. It should run the database migration and seed script during the package update but if running them manually will show you any error then clear the cache and existing sessions. As a last step before restarting the service you can optionally run the foreman-installer in simulation mode to verify the installation and see pending config changes, if some are shown run the foreman-installer again to apply them finally. Foreman Maintain is a newly developed tool which tries to automate the previous tasks. It can handle multiple strategies for backup and restore, like offline and online, full and incremental. It ensures system health during Update and its maintenance mode prevents access to Foreman. Foreman provides a web based JSON API which is shared with Katello. This is Version 2 of the API which is favored instead of the already deprecated version 1. It requires an authentication by username and password. Perhaps unusal is the handling of collections which are paged in the same way like in the webinterface. The same way it handles search strings like they are provided in the WebGUI but they have to be URL encoded. The commandline interface for Foreman is based on the Hammer CLI which is basicly a framework written in Ruby based on clamp. Foreman provides a plugin to manage most aspects of Foreman like the WebGUI and the API. Some of the Foreman plugins also provide a Hammer plugin, like some other tools especially around Katello do. But the framework is not limited to the Foreman environment, so feel free to create your own plugins to solve your own administrative tasks. Make sure to provide the correct credentials. Create the new Operatingsystem entry for "CentOS 6.8"
Foreman has build in multitenancy which is starting from version 1.21 enabled by default. Depending on your needs you can add Organizations and/or Locations. Every object will require exactly one context with the exception of users who can have multiple contexts and one of these assigned as their default context. But he has to keep care of in which context he works because objects he creates will be in this context. Organization and Location can both be nested to represent a hierarchy with a top-down approach. Both Foreman and the Smart proxy write an excellent log file. Foreman log files are located in "/var/log/foreman" and its main log is called "production.log". You can find all accessed URLs and errors generated by accessing it. If the standard log level does not provide any information it is possible to increase the log level by changing the configuration in the "/etc/foreman/settings.yaml". Furthermore it is possible to enable additional specific loggers. 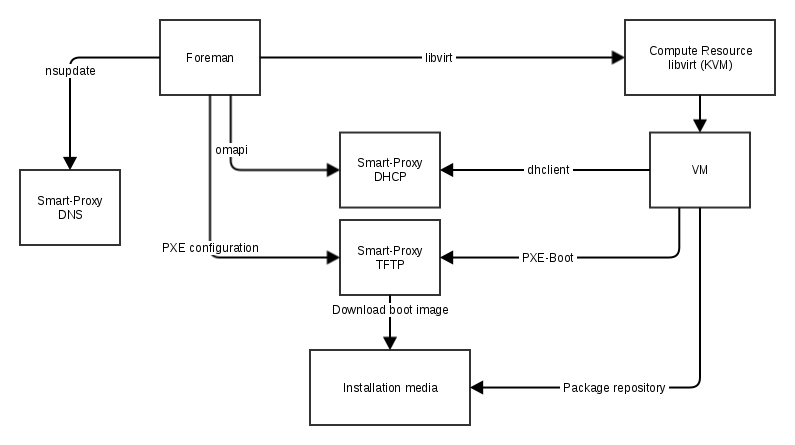 The log files of the Smart proxy are located in "/var/log/foreman-proxy" containing all errors issued by the Smart proxy like downloading of boot images failed and failed updates of services. If additional details are needed increase the log level in "/etc/foreman-proxy/settings.yml". 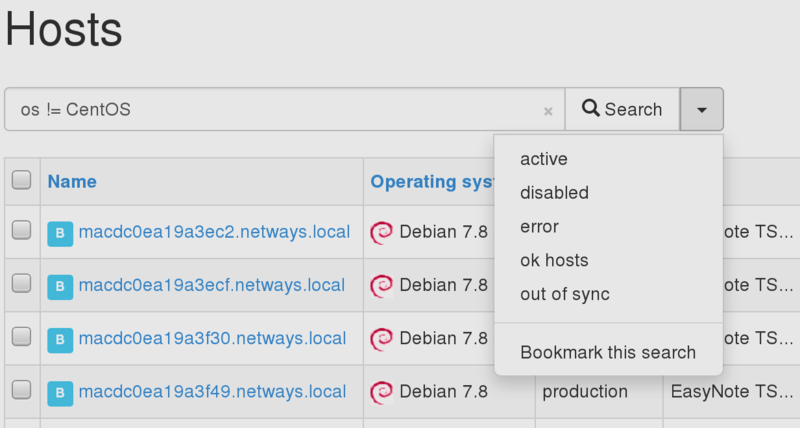 Plugins to both components can add directly to the log or write their own, so have a look into their configuration if attempting any troubleshooting with a specific plugin. Troubleshooting of the provisioning process can be required if deployment of a system fails or differs from expectation. In most cases the output of the WebGUI is quite useful, but sometimes a deeper look is required to find a solution. In this URL you can change the template type provision to every other type to get those files. If everything here seems to be correct, check the communication in the Foreman log. Getting the exact URLs from the log and browsing them can help to find issues like token on a boot disk expired. Next step would be to look for errors in the Smart proxy log if the download of the boot images or some configuration changes issued to the managed services have failed. On the TFTP server have a look at the boot image, it is downloaded only once during the first deployment of a host started. If somehow the image was already downloaded you will not find any new log entry about the failed download. Also in some rare cases distribution releases a newer version of the boot image to fix some installation issues. So check the size and checksum of the image if the boot fails. In the case there is no PXE configuration you can cancel and restart the build process or execute a rebuild from the "All Hosts" menu. If the deployment of the system works but something is not configured in the expected way have a look in the reports of the configuration management. In many cases Puppet code is not well designed or has some cross system dependencies so the agent has to run more than once to complete the full configuration. The Foreman team tries to help with issues as good as they can. To achieve this there are several ways to get support available. If your problem is not covered there the fastest way to get in touch with the team is the IRC Channel. The channel #theforeman is hosted on irc.freenode.net, the developer channel #theforeman-dev is only for support on development of Foreman and plugins. The mailing lists have been replaced with Discourse to provide a Community Platform which is basicly a forum with mailing list support. You can get help here, discuss development and follow release workflow including test weeks. Sometimes you could be asked to send a debug report which could be generated with "foreman-debug" including the complete configuration stripped of security data. With "foreman-debug -u" it could be uploaded to a location only accessable by the Foreman core developers. Webinterface should be available using HTTPs include "Welcome to foreman"
Foreman log should not have entries "500 Internal Server Error"
Smart proxies log should not have entries "ERROR"
For monitoring Foreman you should include a check to verify if the Webinterface is available using HTTPs and if it includes the string "Welcome to foreman" as it is possible that it shows a stracktrace if something is goes wrong. If using monitoring plugins with Icinga or something similar you could use check_http. During provisioning also plain HTTP requests will be required, but you can not simulate exactly this request because of redirect rules directing the request to HTTPs. Log entries containing "500 Internal Server Error" will typically indicate a software failure caused by something not running properly or a bug. Check_logfiles provided at http://labs.consol.de could be used to monitor. To monitor the Smart proxy query the feature list for expected features as a feature will be deactivated if an error during startup occures. In the log monitor for entries marked as "ERROR". Best way to verify that Puppet is available is trying to get a catalog and check it for some content like the name. It will require to use the client certificate of the host for authentication. For Puppet 3 this could look like this. DNS functionality is best checked by a specific combination of name and address and could be simply included for every host. DHCP providing DHCPOFFERS can only be verifed from systems not being the DHCP server and should ask a specific DHCP server to ensure answers are not provided from another system. Subscription management is primarily implemented for cosuming Red Hat Content you subcribed. Red Hat allows to create a Subscription Manifest to move Subscription management from Red Hat Network to your environment. This manifest includes the certificates required for communication and the subscription data. Red Hat Repositories View shows available products and repositories covered by the subscription data and allows to select them which will automatically create and synchronize them to your system. For SUSE a similar workflow can be enabled when using the Foreman SCC Manager plugin which is available as package and you can find upstream at https://github.com/ATIX-AG/foreman_scc_manager. The Content Hosts cosume these subscriptions in the same way like they were directly connected to the Red Hat Network. If you purchased Virtual Subscriptions it requires you to run virt-what and report your virtualization hosts before you can consume subscriptions with the virtual machines. For other software Subscription Management can also be useful by simply tracking all subscribed Content Hosts for products. Contribute to the Foreman training on Github to make it even better. Material is licensed under Creative Commons Attribution-ShareAlike 4.0 International.